After the excellent History of Nintendo: Volume 1 book, publisher Pix'n Love is expanding its catalogue to Nintendo's great rival and its legendary mascot. 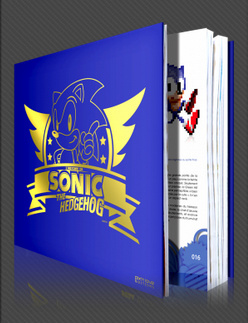 Early 2012 sees the release of The History of Sonic, a 300 page guide to the genesis and development of SEGA's greatest hero, including concept sketches and developer interviews showing how the hedgehog came to be. It's currently only available to pre-order in French for €30, but Pix'n Love has confirmed to us that English pre-orders will commence soon, with free worldwide shipping too. You can take a sneak peek at the book and pre-order at the Pix'n Love site. I'll get it for sure. My new best reason for living. very nice. although a history of SEGA book wouldn't go amiss either. This sounds really cool. I loved me some Sonic back in the day. I agree, a History of SEGA book would be awesome, though it's been going so long I think a series of books would do better. I wonder if anyone out there is reading these requests..? I might get this... havn't pre-ordered history of Nintendo vol 2 yet, Christmas is only round the corner so I'll put it on my list. "a 300 page guide to the genesis..."
How much will this cost? Will try and get this. Im planning on buying this but do i need to register to buy this book? @ChaosTheChao Not sure on a price yet, previous ones were about £24 I think. Should know in a week or two. @SegaGamer93 Not sure what you mean? The UK pre-orders are open soon so no need to rush in just yet! I will not sleep until I have this hallowed tome within my clammy grasp! The tag of 'Awesome' is completely apt for this article; this is a superb bit of news. I was lucky enough to meet one of the French representatives of Pix 'n Love at Replay 2011, alongside a sound English fella who was involved in translating, marketing and publishing The History of Nintendo: Volume 1 and future works by Pix 'n Love in the UK. They were both incredibly friendly and had a wacky sense of humour that fit perfectly with their passion for releasing the awesome Pix 'n Love gaming literature in both France and then the UK. They were also kind enough to show myself and my friend Jake from MegaDrive.me further volumes of The History of Nintendo and a preview of The History of Sonic, all in French of course. The classy design and enthusiasm towards the subject matter was abundantly clear, even though I could not understand the specific content of the text. It goes without saying that both Jake and I invested in a copy each of The History of Nintendo: Volume 1 on that day. Stellar stuff, I wish these guys all the best for their publishing endeavours in the future. I also fully agree with the comments above regarding a History of SEGA series of books, that would be splendid. Totally would love to own this book, all depends on my money. The links come up with the French site!